For now Havelock becomes a Christian. The old Charter House feelings had died away. How they were revived we have no exact knowledge. Havelock's Christianity always partook of the nature of the man—stern, outspoken, uncompromising, but very averse to dwelling upon or analysing his own feelings. We only know that on his outward-bound voyage to India in 1823, in the twenty-eighth year of his age, "the Spirit of God came to him with its offer of peace and mandate of love, which, though for some time resisted, at last prevailed." A fellow voyager, a Lieutenant Gardener, was of great use to him at this time. Havelock taught him Hindostanee, and he taught in return the elements of the doctrine of Christ, giving him to read, as we find, the "Life of Martyn," and Scott's "Force of Truth." And so he seems to have stepped upon the soil of India, the land with which his name must henceforth be associated, a confirmed and consolidated Christian character; and to have henceforth regulated his upright, downright, straightforward life, not by the gentlemanly maxims of the mess, nor by the unsteadfast emotions of an "honest English heart," but by the power and in the strength of duty, as taught from the lips of Him who has brought duty as well as immortality to light. To virtue every triumph that he knows." "Let me ask, my good friend, what it is you mean by prejudices against me. Tell me plainly; I am not aware of any. Old ------ and others used to tell me that it was believed at the Horse Guards and in other quarters, that I professed to fear God, as well as honour the Queen, and that Lord Hill and sundry other wise persons had made up their minds that no man could be at once a saint and a soldier. Now, I dare say such great authorities must be right, notwithstanding the example of Colonel Gardiner, and Cromwell, and Gustavus Adolphus, (all that I can think of just now;) but if so, all I can say is, that their bit of red ribbon was very ill bestowed upon me, for I humbly trust that, in that great matter, I should not change my opinions and practice, though it rained garters and coronets as the rewards of apostasy." "You are quite right; in public affairs, as in matters eternal, the path of popularity is the broad way, and that of duty the strait gate, and few there be that enter therein. I shall have been half a century in the world if I am spared another month, and I end in opinion where I begin. Principles alone are worth living for, or striving for." Meantime, long before promotion came, and before these letters were written, he had "lived his life " honestly and truly. He taught and instructed the religiously-disposed men of his regiment, and formed a little band of Baptist " saints," whom the rest respected. " I know nothing about Baptists," said bluff Colonel Sale, "but I know that I wish the whole regiment were Baptists, for their names are never in the defaulter's roll, and they are never in the lock-up house." "Call out Havelock's saints," said Sir Archibald Campbell, when the Burmese threatened an outpost unexpectedly at night; they "are always sober, and can be depended on, and Havelock himself is always ready." An officer sauntering through the passages of the Great Pagoda at Rangoon, suddenly found himself in a little room with idols in the niches, each holding a lamp, by the light of which the pious soldiers of the 13th, with Havelock in the midst of them, were standing up and singing a Christian hymn to the one living God; even as, long afterwards, within the walls of beleaguered Jellalabad, surrounded by an overwhelming force of enemies, and ere yet the earthquake had hurled its fortifications into ruin, he read in the midst of the military square, '' God is our refuge and our strength: Therefore we will not be afraid, though the hills be carried into the midst of the seas; though the mountains shake with the swelling thereof! " More brave for this, that he hath much to love." "My dear George,—This is your birthday, and I sit here in sight of the house in which you were born, five years ago, to write you a letter. My office is gone to Poonah, and I have nothing to do but to think of you. But your brother Joshua is very busy in the next room, reading Mahratta with his pundit. However, he says that he too will scrawl a note for you as soon as his daily studies are over. I dare say Harry is remembering you too, but he, you know, is a long way off from us now, in the Punjab. "Read all the accounts of the battles of Alma, Balaklava, and Inkermann, and if by God's blessing we meet again, I will explain them to you." And Fear, and Bloodshed,—miserable train! As more exposed to suffering and distress." From well to better, daily self surpast." "As he returned to the causeway, the weary soldiers who were grouped on it, leaning on their arms, suddenly caught a glimpse of him, and in an instant there was an enthusiastic shout through their ranks, 'Clear the way for the General!' A bright smile stole over the stern features of the old chief, as he exclaimed, 'You have done that well already, men.' This unexpected compliment electrified the troops, and as his form gradually disappeared, 'God bless the General!' burst from a hundred lips." So, too, at that last, deadliest fight, when Havelock and Outram, twins in fame, struggled at the head of their men into that world-famous Presidency—the loopholed houses on either side pouring forth a stream of fire as they advanced, every roof sending down a shower of missiles, with deep trenches cut across the road to detain them under the fire of the adjacent buildings, and from every angle of every street a volley of shot scattering death—when at last they arrived, it was no wonder that the garrison and the Highlanders, the deliverers and the delivered—nay, the children and the women, united in one rapture of acclamation and of welcome to the soldier who in deepest need had proved himself worthy of the name. Thus died Havelock—thus, and even better. 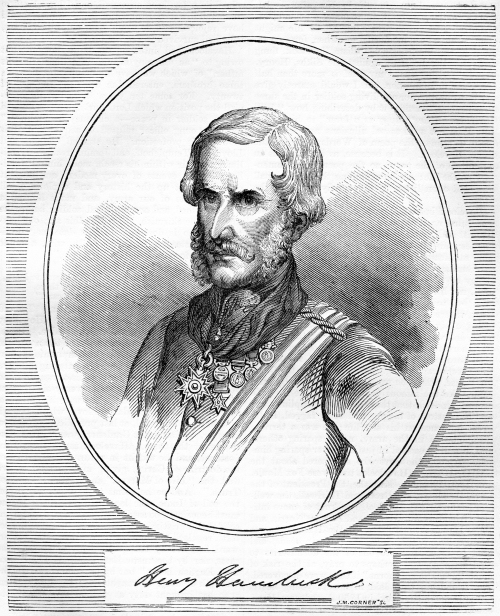 For while he found, as he had ever done, a deep comfort in himself, in his cause, and in the witness of Heaven authenticating the verdict of his conscience; while he said, most truly and characteristically, to his brave comrade Outram, ''I have for forty years so ruled my life, that when death came I might face it without fear;" he also called his son, the inheritor of his honours, to see how a Christian could die, and affirmed in these last hours the trust, not in himself, in which he had entered upon the campaign. Weeks before he had written to his wife, — "I must now write as one whom you may never see more, for the chances of war are heavy at this crisis. Thank God for my hope in the Saviour. We shall meet in heaven."